I was recently asked for help on a Google Checkout problem where the Google Checkout Button on the Magento cart page was disabled with a message saying: “Not available with these items“. The disabled Google Checkout button on the Magento cart/checkout screen. It looks like the normal one only greyed out. The big clue was the parameter on the Google Checkout button image URL on the problem store. It had variant=disabled which is generated server side, and so had to be coming from somewhere within Magento. A big fat grep over the code uncovered a variant=' string fragment in Link.php. Even if it's not immediately obvious why the enabling/disabling of a product for Google checkout is a price related option, this is where it is located. This drop down let's you select whether a product can be sold via Google Checkout. This was a feature introduced in Magento 1.2 to help stores that want to use Google Checkout but have some products which may breach the Google Checkout policies. Great idea. The question remains, and hopefully we will find out, if somehow the setting has been turned on for the user who posted a comment having difficulty with this disabled Google Checkout button during Magento checkout. Thank you! Exactly what I needed to know. I just ran into this after upgrading to 1.3.0. Does this mean that I will have to manually update HUNDREDS of products to “Yes” or is there a global setting somewhere? I’ve searched around and don’t see a global setting but thought perhaps someone else has found it. 3) Under the Actions drop down choose ‘update attributes’ then submit. 4) This takes you to a bulk update page, where you can choose to change the Google Checkout status for all of your products. If you have 1000’s of products this might time out or crash. In which case let me know because I will write some SQL to do it and post it here. But only if there is a need for it. Much needed SQL update script for this problem. I want to fix the database once and for all, as at present I simply disable this check. 1000’s of products, so yes, Magento WILL crash.. I have written about about how to bulk update your Magento products to enable them for Google Checkout. Let me know how you go. I have google checkout enabled, but i get the grayed out logo. If you click the logo it takes you to checkout. Am I missing something in your fix. Do I have to manually override it somehow? That’s really odd, because normally if it is grey you can’t click it. Can you check the URL of the image? @Greg Don’t change core files!. Also that might mean that new products (where the boolean is correct) would be disabled instead of enabled? Certainly if you do what Greg suggests, make a local copy of the core file, and test it first before making the change in production. @Ashley.. You are right, my bad. Although for anyone in my position where I have 90K products and want all of them available via Google Checkout it is an option… The script works, but on that many products it takes a while, and with daily updates it may never end! Thanks for posting this, I was bitten by the exact same problem. 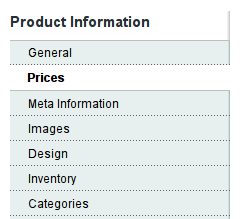 Products->Prices — sneaky place to hide this Google Checkout setting, since pricing has nothing to do with checkout.